The Dunedin coastline is a haven for wildlife. 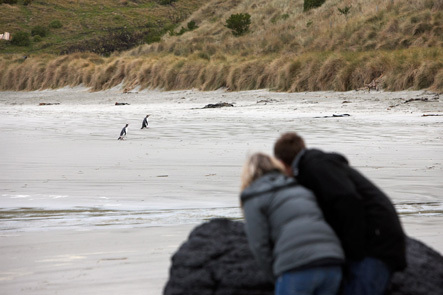 The Otago Peninsula is one of New Zealand's most renowned eco tourism areas. There are unique opportunities to view a remarkable range of wildlife including Royal Albatross, rare Yellow-eyed penguins a variety of seals, sea lions, water and wading birds. We have tours to visit Penguins and Albatross colonies. Along the way we will see an abundance of the local coastal flora and fauna. You will learn of the extensive efforts to protect the wildlife from land based predators. The viewing facilities are designed for minimal human impact on their environment and offer great opportunities for photographers and wildlife enthusiasts. Dunedin City and head onto the Otago Peninsula, home to the rare Yellow Eyed Penguins and majestic Royal Albatross. Experience the pristine views from up high along the top road of the Otago Peninsula. See plenty of sheep on the small farms and learn about the local Maori who have lived in Dunedin and on the Otago Peninsula for centuries. We arrive at Penguin Place for the first wildlife tour of the day at the Yellow Eyed Penguin Conservation Reserve. Taiaroa Heads at the end of the Peninsula for the second wildlife tour at the Royal Albatross Colony. Dunedin City for a brief city sights tour which includes a visit to Baldwin Street on route to the ship's wharf at Port Chalmers. * Viewing of Penguins and Royal Albatross is expected but not guaranteed. Entry fees to both wildlife tours are included.